Apple held their “Back to the Mac” keynote yesterday. Despite the online media saturation of all things Apple, some of you were probably unable to sit down and watch the live stream of the event. (You can watch a video of the keynote if you want to see the whole thing.) For the chronologically challenged, here is a quick recap of the keynote. Apple announced FaceTime for Mac, a beta of which is now available for download. As with the iPod Touch, you initiate the call by choosing an email address from your contacts list. A new iLife suite is available for purchase. iLife ’11 includes some improvements to the most popular applications in the bundle. iPhoto gets new full-screen modes, nifty social media integration and new slideshows. (iPhoto will now load photos from Facebook and Flickr, and will even import activity and comments for photos you share.) iMovie gains a function to easily make Hollywood-style movie trailers, advanced audio editing and facial recognition. Garageband adds tools for fixing timing issues in recorded instruments, new amp and “stompbox” effects, and improved instrument lessons. With iLife out of the way, Steve moved on to Mac OS X 10.7 “Lion,” which will be released in the Summer of 2011. It’s biggest feature is probably the new Mac App Store (which is a self-contained application, rather than being integrated into the behemoth that is iTunes). 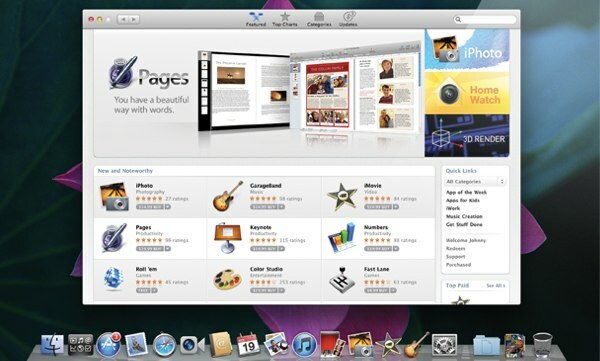 Jobs assured everyone that it will not be the only way to obtain software, as that would be detrimental to the Macintosh platform, but that it will be “the best way.” The Mac App Store will be coming to Snow Leopard within 90 days, and developers will be able to submit applications starting in November. The App Store should be good for both users and developers. It makes it easier to discover new software, and easier for developers to get their app out there. The 70/30 revenue split is the same as the one for the iOS store. The next iPad-inspired 10.7 feature is “Launchpad,” an iPad-style springboard that is summoned much like Dashboard is on current versions of OS X. You can page through your installed applications there instead of browsing to your Applications folder or dropping it on your Dock. (Personally, I keep my most commonly used apps on my Dock and launch the rest with Spotlight.) With it comes “full-screen apps,” which exist outside of the Desktop interface. You can flick to the left with your trackpad and switch to one of your open full-screen apps. This would be good for games, which already run full-screen for the most part. It provides a standard interface convention for managing those sorts of applications. Mission Control is the new UI system that brings the existing Exposé, Spaces and Dashboard tools together. Your open windows appear in the center, grouped by application. Along the top are thumbnails to switch to your open full-screen apps, the desktop and Dashboard. Jobs’ One More Thing™ was a new MacBook Air. It’s thinner, it’s faster, it comes in 13″ and 11″ sizes…and it will last up to 30 days in standby mode (battery life during actual usage should be around 7 hours). As it uses an SSD (64GB and 128GB on the 11″, 128GB and 256GB on the 13″) and has no optical drive, the MacBook Air has no moving parts. It weights under three pounds, and is 0.68 inches thin at the tallest point. Actually, if you consider the size of the 11″ model, Apple has built a better netbook than their competition. Price, it may not compete on, but it certainly excels in all of the aspects that make a good netbook. It’s thin and light, it has exceptional battery life, and it wakes very quickly from sleep. The MacBook Air is available for purchase, starting at $999 for the 11″ model and $1,299 for the 13″.